Jennifer Ross is a native of Baton Rouge, Louisiana. She is a professional in the hospitality technology industry. She has been a dog owner and lover all her life and comes from a family that bred and raised German Shepherd show dogs. This is her first literary work. Currently, she lives near Fort Worth, Texas, with her husband and three dogs -- Bess, Samantha and Pax. 20% of the Author's royalties are donated to pet rescue. 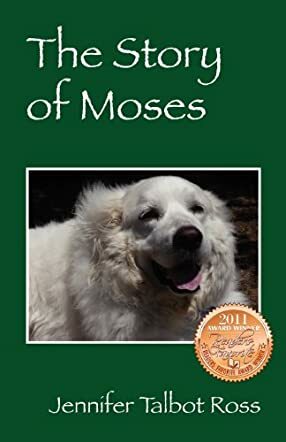 The Story of Moses written by Jennifer Talbot Ross is the true story of Ms. Ross and the remarkable dogs she was lucky enough to have in her life. To tell the story of Moses the author shares with us the stories of the other dogs she had prior to Moses, and how each dog impacted her life and ultimately led her to Moses. The first dog we are introduced to is Cleopatra (Cleo), a beautiful lab who was rescued by Ms. Ross's grandmother and daughter. Being a single mother at the time she was hesitant to take the puppy, but she couldn't resist. While the author states she had always had animals in her life, it really seems that Cleo opened her heart for the love affair she shared with dogs in her adult life. In addition to Moses and Cleo, we also read the stories of Odin, Bess, Samantha and Pax. As the author shares each of their stories, you feel the love the author has for her dogs. She shares their funny antics as well as their sometimes neurotic behavior. When Moses comes into her life from an ad on Petfinder.com, she finds a gentle giant of a dog that seems to love life who felt it was his job to take care of her. While cancer cut Moses' life short, she was blessed to have shared five years with him! The author has a wonderful way of writing that makes you feel as if you are listening to an old friend talk about her pets. Her love of animals comes across so strongly that the emotions jump off the page at you allowing you to share her joys and also her grieving when she loses a beloved pet. She also shares with the reader bits of interesting information about the breeds of dogs she has. I also felt the information she included in the back of the book about the SPIN, Saving Pyrenees In Need, was great, and her reminder that rescue animals make wonderful pets was the perfect ending to Moses' story. A heartwarming story that all animal lovers should read, I only wish the author would have included more pictures of her beloved animals! If you’re on the fence about getting a pet you should read these stories. They just might help you realize your new best friend is just waiting for you! I am Jennifer's mother and have known all of her dogs so am able to vouch for their friendliness, intelligence and wellbeing. I only wish the book had been longer. There were more anecdotes that could have been included. Realize I am prejudiced but it is still a good read. Yes, rescued dogs make good pets. The love, the fun and the responsibility of owning mans best friend comes across clearly in the stories of her dogs. I have owned, loved and lost a few beloved family dogs and the Story of Moses brings back my wonderful, funny, sometimes aggravating memories of them. it's a fun read, you laugh, you cry and then you laugh again. I also love dogs and have had German Shepherds, a shelti and a mixed breed. Enjoyed the book.